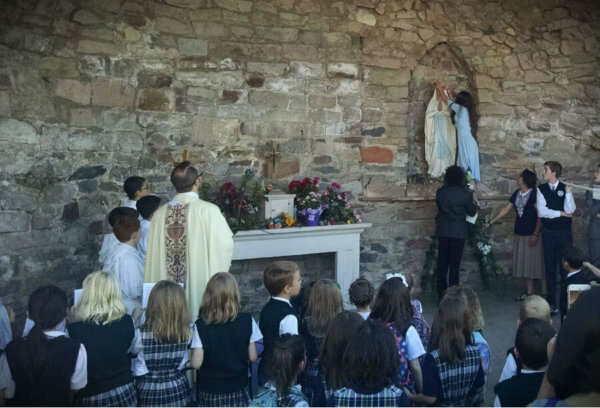 WASHINGTON — Each year on Nov. 1, the feast of All Saints, the classrooms at Our Lady of Lourdes Catholic Classical School in Denver are not full of students, but of little saints. Dressing up as the saints is what the principal, Rosemary Anderson, describes as part of her students’ “joyful witness of the faith,” which serves as the foundation of Lourdes Classical. Students at Lourdes attend Mass four times a week, recite ancient poets, such as Ovid, and begin learning Latin in kindergarten. Lourdes Classical is part of a classical education approach to Catholic schooling, a movement gaining momentum in schools across the country. In 2012, the parish school at Our Lady of Lourdes Catholic Parish in Denver shifted from a traditional Catholic school, to a classical educational approach. At the time, they had fewer than 100 students. Today, 224 students, prekindergarten through eighth grade, are registered for the upcoming school year. By combining the richness of the Catholic faith with the components of a strong education in pursuit of the true, the good and the beautiful, Lourdes Classical allows for students to encounter virtue “in all the circumstances of life,” according to Anderson. Lourdes Classical is not the only Catholic classical school in the Archdiocese of Denver. Frasatti Catholic Academy will open its doors for the first time this fall, and Bishop Machebeuf Catholic High School recently added an optional classical track to their curriculum. Classical education finds its roots in the classical world of art, literature and philosophy, which then developed through Western education, according to Michael Van Hecke, president of the Institute for Catholic Liberal Education. But for Catholic schools using a traditional education models, classical themes can still be introduced. In the fall of 2016, the Cardinal Newman Society, a nonprofit organization dedicated to “Promoting and Defending Faithful Catholic Education,” published a revised Catholic Curriculum Standard for Catholic educators. “The standards rely primarily on the church documents on Catholic education with additional resources coming from Catholic and classical authors,” said Denise Donohue, deputy director of K-12 programs at the Cardinal Newman Society, in an email July 19 to CNS. While not exclusively classical, the Catholic Curriculum Standard expands upon several classical themes. “The standards are premised on the key components of the integral formation of the human person, man’s intellectual ability to understand objective reality, the dignity of the human person and the acquisition of virtue, a synthesis of faith, life, and culture, and the development of a Catholic worldview to bring the student deeper into the heart of the Catholic Church,” Donohue wrote. Twelve U.S. dioceses implemented the use of Catholic Curriculum Standards, spanning over 390 schools and 119,258 children. In addition, other schools have adopted the standards for use in various capacities. The Institute for Catholic Liberal Education hosts several conferences and programs throughout the year, as well as teacher formation programs. In addition to service programs in schools, they founded the Catholic Textbook Project, a textbook series specifically for Catholic Schools, which are used in almost 100 dioceses. In addition to being president of the Institute of Catholic Liberal Education, Van Hecke is publisher of Catholic textbooks and headmaster at St. Augustine Academy in Ventura, California. Not only are schools throughout the nation adopting a classical approach to education, but they’re helping others establish classical schools of their own. Parents and parishioners of St. Jerome Catholic Church in Hyattsville, Maryland, came together to write a new curriculum program for St. Jerome’s Academy, which not only turned into a plan for their school, but has been an influence on schools around the country, such as St. John Bosco Schools in Rochester, New York, which uses part of the St. Jerome’s classical education plan. With much support from the Archdiocese of Washington, both financially and philosophically, St. Jerome’s Academy now thrives as the only classical Catholic school in the archdiocese. The classical school movement isn’t just circulating among elementary schools, but high schools as well. On Sept. 4, nine students will embark on a four-day canoe camping trip to start off their school year, engaging the students in “sacramental imagination,” according to Deacon Chris Roberts, president and theology teacher at Martin Saints Classical High School. While not the only classical high school in the Philadelphia area, Martin Saints Classical High School will open north of Philadelphia this fall. The school is part of the Chesterton Schools Network, which provides curriculum and support for parents seeking to establish their own classical high schools.